@craigweb When I look at the pages on the server they work, yet it's not working from my desktop. Might be firewall related/vpn related. Here is the error log from my desktop. The server is running with a dual nic. Think that might have an impact? mangoUi~ngMango~ngMangoServices.js?v=0f03d20f7b30b4a597f9:78 Markup '<md-button flex></md-button>' may not work as expected in IE Browsers. Consult 'https://github.com/philipwalton/flexbugs#9-some-html-elements-cant-be-flex-containers' for details. I'm having a strange difficulty in getting values on my pages. System is running v3.5.6 running on a Windows 2012 Server R2. What's odd is that I can see them when looking at v2. The below returns nothing, yet attached the image of the same point in v2. style="position: absolute; left: 114px; top: 71px; width: 237px; height: 59px;"
I have a basic Excel Report with three columns - Timestamp, Value1, Value2 with the named ranges in only three rows that doesn't complete it's run cycle. The State remains in Running. OS is Windows 10 and I'm running the latest versions of Core and Modules. Mango is running as a Windows Service. I'm thinking the error below with regards to the Timezone is the problem but I'm not sure how to fix it. I've upgraded to 3.4.1 and have put JAVA_HOME= variable in /overide/env.properties but the compile still fails. Compiler not found. Are you running on a JRE? Any other suggestions? Is it possible to manually compile it? Still, nothing in the ma.log that relates to this. 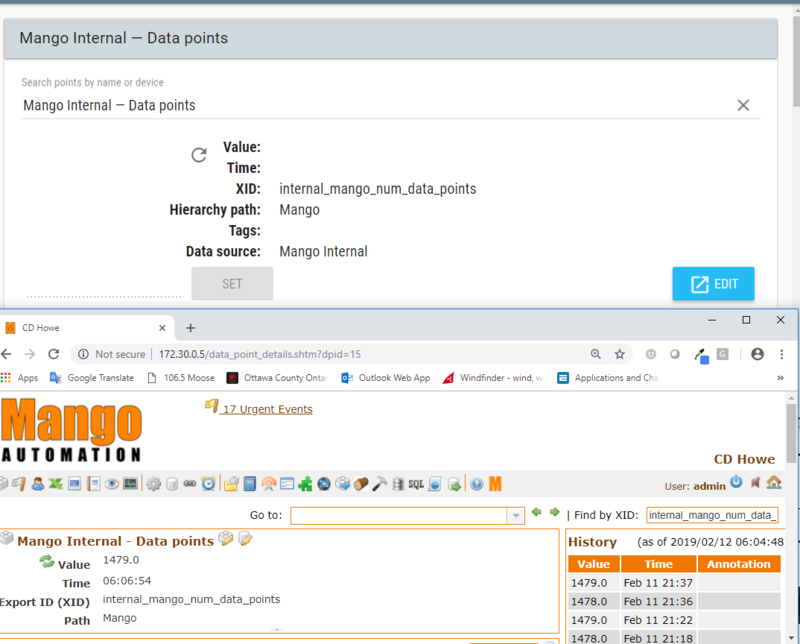 We're experiencing challenges connecting to OPC Servers with Mango and would need to know where to get more documentation. Not all OPC Servers require authentication.